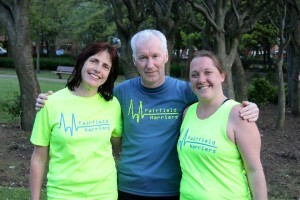 Fairfield Harriers started in 2014 to bring together Runners of all abilities to meet every Wednesday for a social run. We are also involved in Saturday morning parkruns in the Cleveland area. Our aim is to introduce encourage new people into running and help to improve the fitness levels of new and existing members of the Group. We manage our running sessions for all abilities with our loop back system. Some of our faster runners always loop back to run with slower runners so that nobody is left behind. . We also run in many of the local and national Running Events and some members compete in Duathlons and Triathlons. The Group is free to join and there are no membership costs. Just turn up and enjoy running with a really friendly group of people.